ON "CARPE DIEM," his lively economics blog, University of Michigan professor Mark J. Perry likes to use Venn diagrams to needle those who "do not have a strong need for intellectual consistency." On topics ranging from drug prices to campus diversity to imports from China, he shows how common it is for people to simultaneously hold contradictory positions, oblivious to the fact that they are logically irreconcilable. All the goodwill in the world can't repeal the Law of Demand: Make it more costly to employ low-skilled workers, and fewer low-skilled workers will be employed. Perry's latest diagram is a riff on two ballot initiatives facing voters in Washington state this Election Day. Initiative 732 would impose a statewide tax of $15 per ton on carbon dioxide in order to reduce greenhouse emissions. Initiative 1433 would increase the state's minimum wage to $13.50 an hour in order to guarantee a "living wage" to all low-skilled workers. As Perry writes, hundreds of thousands of progressive Washington voters will doubtless support both ballot questions, oblivious to the contradiction in doing so. After all, if you recognize that artificially hiking the cost of using fossil fuels will give emitters an incentive to shrink their carbon footprint, then you should recognize that artificially hiking the cost of hiring low-skilled workers will give employers an incentive to shrink their workforce. Conversely, if you don't believe a higher minimum wage will reduce employment opportunities for unskilled laborers, then you shouldn't expect higher taxes on carbon to reduce energy use that generates CO2. He who says "A" must say "B" — unless he has no need for intellectual consistency. There's little mystery about what happens when the price of something goes up: All other things being equal, the demand for that something — a quart of strawberries, a ticket to Pittsburgh, a new waitress — goes down. The Law of Demand is about as fundamental an economic axiom as there is, and it can't be revoked by politics or worthy intentions. Force up the cost of employing low-skilled workers, and fewer low-skilled workers will be hired. Lawmakers, journalists, and activists typically disguise the real-world impact of minimum-wage increases behind sentimental language about compassion and social justice. On Wednesday, the Cook County, Ill., Board of Commissioners voted to mandate a phased increase in the minimum wage to $13 an hour. The commissioners, reported the Chicago Tribune, were "seeking to help lift people out of poverty by raising the wages of the lowest-paid workers." The sponsor of the ordinance, aglow with self-righteousness, proclaimed passage of the new measure "the moral and right thing to do." Wouldn't he and his fellow commissioners, he demanded, find it unbearable to live on the state's minimum wage of $8.25 an hour? Perhaps they would. But they would find it even more unbearable to live on an hourly wage of $0. That's the true minimum wage in Cook County and everywhere else — and it will be earned by unemployed, low-skilled workers who won't receive paychecks they would have received if the new ordinance hadn't dissuaded employers from hiring more people. It's easy to see — and, if you're in politics, to take credit for — the extra money some workers earn when a minimum-wage hike is legislated. What's not seen are the paychecks that are never issued because businesses didn't expand. Or because companies decided to invest in new equipment instead of new employees. Or because workers' hours were cut back. 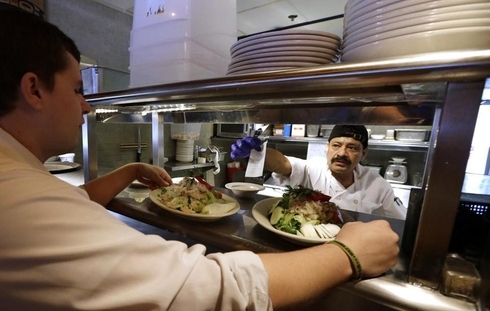 After Seattle's minimum-wage hike took effect, Ivar's Seafood Restaurants announced that it was raising menu prices by about 21 percent. Consider Seattle. In 2014, city officials adopted a $15 an hour minimum wage and subsequently hired University of Washington researchers to assess the law's impact. The report, issued in July, found that while low-wage workers who kept their jobs were indeed paid more per hour, "the unintended, negative side effects on hours and employment muted the impact on labor earnings." Sadly but predictably, "the Seattle Minimum Wage Ordinance appears to have lowered employment rates of low-wage workers. . . . The effects of disemployment appear to be roughly offsetting the gain in hourly wage rates, leaving the earnings for the average low-wage worker unchanged." Seattle isn't anomalous. Investor's Business Daily reported last week that Dunkin' Donuts franchise owners in New York "are dragging their feet in opening new stores amid concerns about a higher minimum wage." In January, Walmart cancelled plans to build two new stores in Washington, D.C., in part because the capital's big minimum-wage jumps have made expansion too risky. The blow to food-industry workers in the city has been even harsher: In the first six months of 2016, D.C. restaurants shed 1,400 jobs — the steepest six-month decline in 15 years. 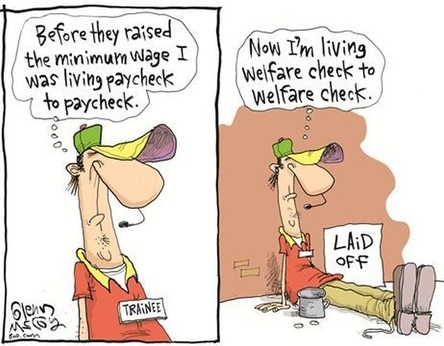 Minimum-wage laws invariably make more jobs unaffordable and more workers unemployable. Bromides about giving a raise to workers on the lowest rung of the economic ladder may give legislators and advocates the warm-and-fuzzies. But workers still struggling to reach the bottom rung aren't fooled. Their life is hard. Minimum-wage hikes make it even harder.